Alan "Mr. Fabulous" Rubin: [As Maitre'd at the Chez Paul restaurant, talking to a caller on the phone] No, sir, Mayor Daley no longer dines here, sir. He's dead, sir. Bob: [Hearing the band playing a rhythm and blues song] That ain't no Hank Williams song! Burton Mercer: Who wants an Orange Whip? Orange Whip? Orange Whip? Three Orange Whips. 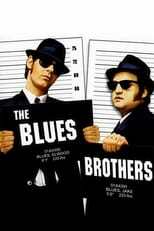 Mrs. Murphy: The BLUES BROTHERS?! Shiiiiiit! They still owe you money, fool! Mrs. Murphy: We got two honkies out there dressed like Hasidic diamond merchants. Neo-Nazi: [To his leader, as they both face certain death] I've always loved you. Old man at Elwood's apartment: You got my Cheez Whiz, boy? Prison officer: One Timex digital watch â€“ broken. One unused prophylactic. (pulls out a pair of tweezers and reaches into the box with them) One soiled. Ray: [to a little boy who tried to steal a guitar and who he pulled a gun on and missed purposely] Now go on, get. Ray: Pardon me, but we have a strict policy concerning the handling of the instruments. An employee of Ray's Music Exchange must be present. Now, may I help you?